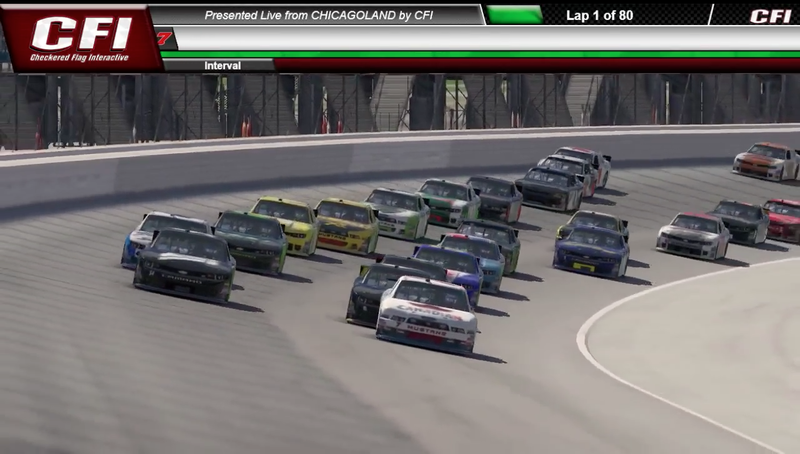 The green flag waves for the drivers at Chicagoland Speedway and the NASTRACK -vs- MORE Challenge. Two leagues, five races, and only one champion! In a community that has been growing in popularity over the years, drivers from all ages and experience levels take to the world of Sim racing for many reasons – cost effective alternative method to racing, training, or just for the pure fun of racing online with your friends. Believe it or not Sim racing has been around a lot longer than you would have expected. The NASTRACK (formally know as OSCAAR), who we will follow through out some of their races in 2015 have been running together for over a decade! “We have been running online races since 2000,” NASTRACK co-owner Shawn Pierce told us earlier this week. “We took over last year as Dave wanted a break. He runs the Oscaar SLM in Ontario, and just did not have the time.” In addition the Oscar series was soon trademarked causing Pierce and Walt Walker (co-owner) to coin a new name, and so NASTRACK was born, running divisions as low as Late Models up to the Xfinity car. Thirty racers are what they wanted, thirty racers is what they got this past Monday evening when the gates opened for practice. It was very clear very early these guys meant business! Keith Maiato (running under the MORE banner – all odd number machines are competing for MORE, even number cars are running for NASTRACK) took his #7 machine to the top of the charts with a time of 31.608 right as practice was about to finish up knocking off the #44 of Travis Wall who was looking to be the man to be during practice. That speed transferred over into qualify as Maiato was able to grab the first pole for MORE in the five race series with a speed of 170.89 MPH (31.600). Steve Burnett, Josh Reeves, Shawn Pierce and Travis Wall were the remainder of your starting five as the field took to the green flag for 80 laps of action where at least two pit stops were guaranteed. For the most part the race stayed pretty calm in the early going as Maiato showed the way with Wall and Burnett hot on his tail. Nothing exciting till yours truly pancaked the wall off turn four which sent the car sideways down the track and through the grass. By the time I got her locked down and attempted to come back on track the leaders had caught me and the caution came out. I did not want it to end that way but I also didn’t want to be crazy on the throttle and have the car fly out onto the track in front of the leaders. With the first caution of the night just about everyone would head down pit road to get some attention from their crews before heading back on the track for the first restart. As the field got the green and worked their way around the mile and a half track to full speed the field quickly found themselves back under yellow just as Wall was making a pass for the lead. After watching the replay we found the #4 of Shawn Pierce was sent around in a pretty violent crash after the #01 of Ken Richardson slid up to track and into the door of Pierce. Doesn’t look like anything was done intentionally but when you get those two left side tires on the apron it tends to mess the car up pretty bad – TWR Motorsports found that out first hand pretty quickly later in the race. With the yellow flag coming out just as Wall took the lead this would allow him the inside line on the restart with the 7 car to the outside of him. 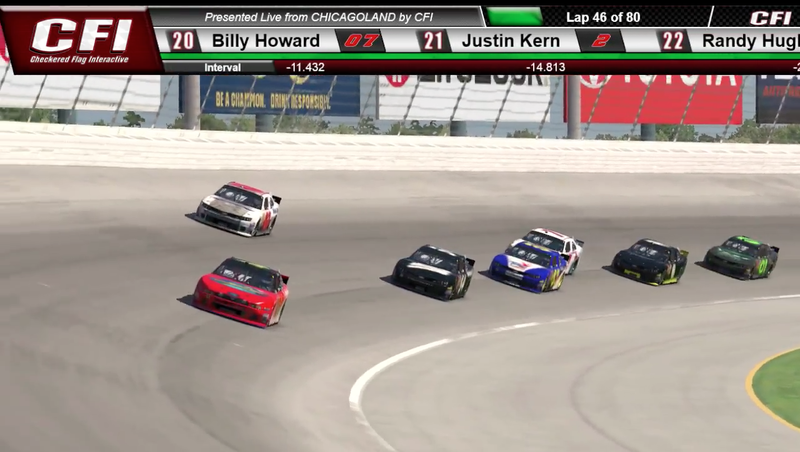 With only damaged cars heading down pit road it was an easy clean up so to speak and the drivers were given the command to double em’ up and resume green flag racing with the 44 of Travis Wall at the point and Maiato getting hung out to dry on the high side… for now! #44 Travis Wall holding on to the lead just after the halfway point. A three-way battle for the lead would ensue with just 35 laps on the board as Wall was able to hold onto the momentum on the high side with Maiato & Burnett forcing the issue on the bottom of the track. The three would remain this way for quite some time until a little contact between the leaders sent the #7 car sliding backwards just as the field came to the halfway point of the race. Though not heavily damaged it seemed just enough both physically and maybe a little mentally to take the 7 car out of the race. The next 20 laps would go by as the leaders were working through lap traffic and then the real fun started – green flag pit stops! As the field started to make their way down onto probably on of the trickiest pit entries on the circuit the #00 of Anthony Warren spins his machine out on the apron bringing out the caution flag yet again. Causing a major mix up with cars already on pit road, and cars still on the track. As they cycled through pit road for what would be the final round of pit stops Todd Marcotte (#53 – MORE Racing) found himself as the control car with Jesse Vaughan (#28 – NASTRACK) to his outside as they took the green flag with just 23 laps left on the board. Immediately Marcotte & Vaughan went to work exchanging lines and a little bit of paint. Vaughan who had a strong car all night just seemed to be in the right place at the right time with the help of timely yellow flags. Speaking of yellow flags just as the field was about to come to ten to go Travis Wall – who had been fighting his way back up though the pack after getting caught on pit road – made contact with the #91 of Jim Locking sending him nose first into the wall, causing heavy damage to his machine while ending the night for Locking. I can tell you this, the one thing a leader does not want to see towards the end of the race because we all know cautions breed cautions! Vaughan with an amazing restart and pulls away from the field with just about five laps to go. Doing everything in his power to hold off the charge from Richardson in the #01 machine. That however was all put to bed when the #14 car of Dennis Schmidt clipped the nose of the #2 car sending both machines hard into the wall causing yet another yellow flag that would eventually seal the deal for Jesse Vaughan and send him to victory lane. #28 Jesse Vaughan sits in victory lane after holding off the field during two late restarts. The gang will pack up their haulers and head out west for 75 laps on the lighting fast Auto Club Speedway in California. Gates will open for practice at 6:45 PM (EST) with qualifying to get underway around 8:30. 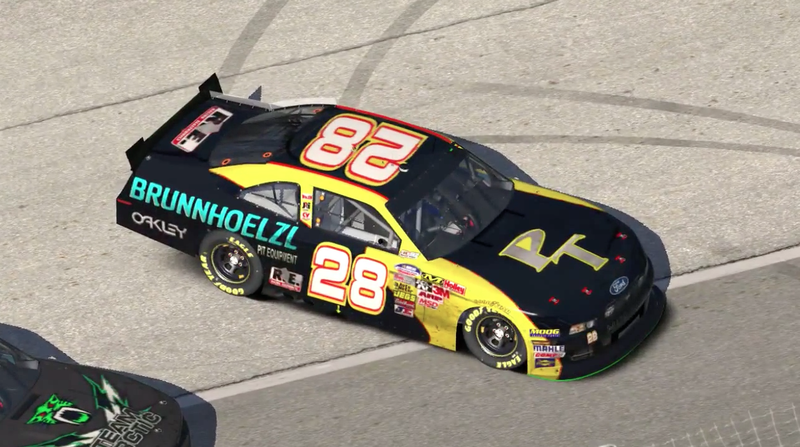 Cant make the race or don’t have iRacing – for the most part that’s okay because you can tune in LIVE on YouTube! Just head over to Checkered Flag Interactive, give them a follow, and stream the entire broadcast from practically anywhere! For anyone looking to sponsor a race please contact NASTRACK officials Shawn Pierce or Walt Walker for further details. Click bellow for the complete full field rundown.